The sun shone on us on Saturday as we headed over to play The Royal Household. The green was very fast and not without difficulties as we tried to accustom our bowls to what our head was telling them! 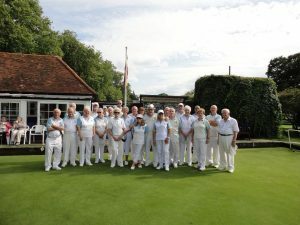 There were wins for Steve G and Ann H’s teams, a draw for Brian C, a nearly-made-it for George H and Laurence & Dawn fought over who had bottom rink (Laurence as his opponents scored on one more end than ours despite shot difference and actual scores!). Being bottom means you quite often get your opposition’s top rink prize and some of us a quite jealous of the engraved glass Laurence, Margaret, Ron & Joan received! It was a competitive yet social afternoon followed by a very nice supper adjourning to the bar for the raffle and then staying on for a further drink. I guess this is what it was like a few years’ ago before everyone dashed off to do something else after a match. Gerry made a very good speech highlighting the successes of the CP ladies this season in their representation of Middlesex and Leamington and the wonderful overall win in the Ladies’ Fours by Ann H, Jean S, Nadine & Cathy T. The men were advised to pull their socks up, enter the Middlesex & National comps next year to see if they could get their and Cambridge Park’s names on the honours board. We are hoping for a re-match outdoors either home or away and the RH would like to play us indoors in 2018-19. Great stuff. National Championships – And the Rest ….